Philippine Festival - Filipino American Association of Central New Jersey, Inc.
Feast of the Black Nazarene - held every 9th of January in Quiapo, Manila. 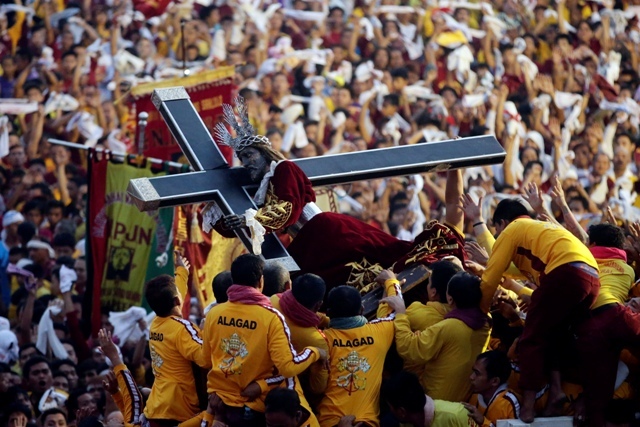 Devotees of that number in the thousands flock around the life-size statue of the Black Nazarene (Jesus Christ) as it inches across the streets packed with devotees around Quiapo church. Devotees attribute many miracles to this 400 year old image which was brought to the the Philippines from Mexico in the 7th century. 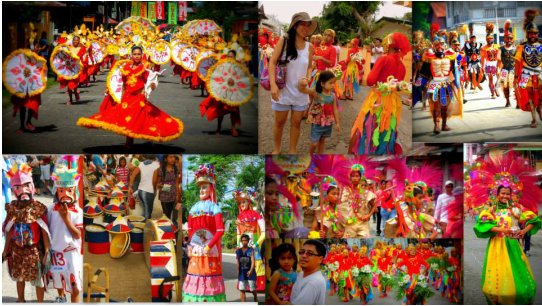 Sinulog Festival - celebrated every 3rd week of January in Cebu City. 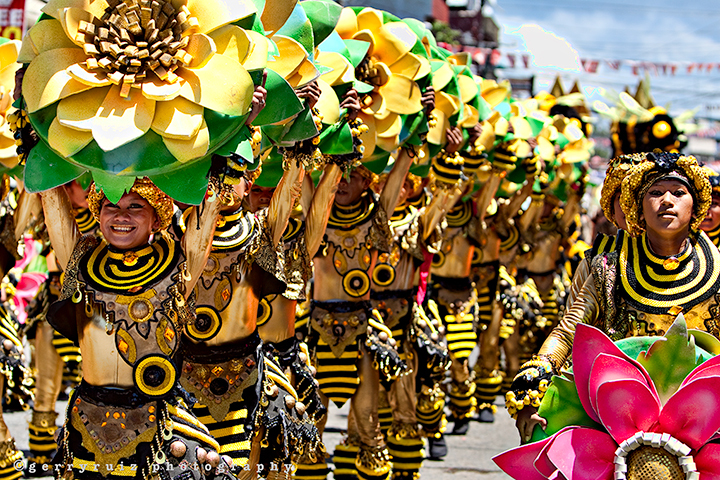 This Philippine fiesta in Visayas region celebrates Cebu's patron saint, the Santo Niño (Child Christ). This week long event is marked by processions, street dancing and parades. This fiesta is a local version of the Mardi gras. 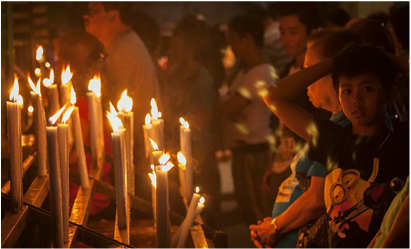 Feast of Our Lady Of Candles - every 2nd of February in Jaro, Iloilo City. 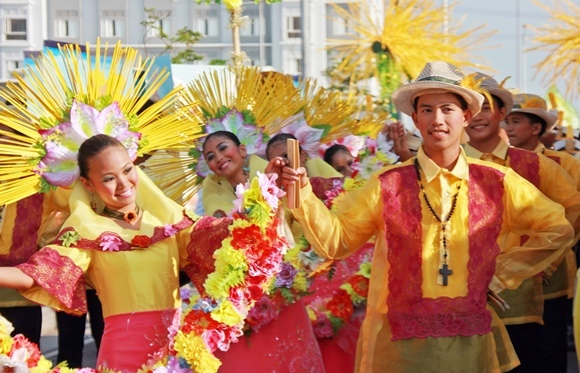 This is the biggest and most opulent religious fiesta in the Western Visayas region. The blessing of the candles and the yearly procession of the patroness, the Nuestra Señora de Candelaria is followed by the fiesta's queen and her court which highlights the fiesta at the town plaza. 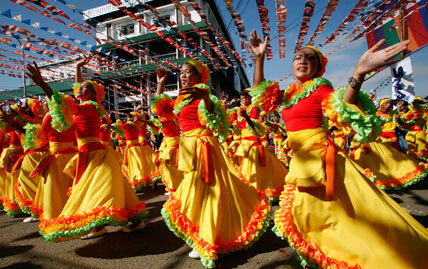 Babaylan Festival - held every 19th of February in Bago City, Negros Occidental. The public gets a rare view into the simulated rituals of mystics, ancient healers and priests in various ceremonies such as marriage, healing and harvest. Eid El Fitir - commemorated every 9th of March in Region XII in Mindanao. Muslim Filipinos mark the end of their 30-day fasting as the crescent moon emerges after the Holy Month of Ramadan. Moriones Festival - reenacted during the Holy Week in Boac, Marinduque. This Philippine fiesta is based on a play about the story of Longinus, the centurion whose blind eye is cured by a drop of Jesus Christ's blood. Actors wear colorful wooden mask and dressed as Roman soldiers. 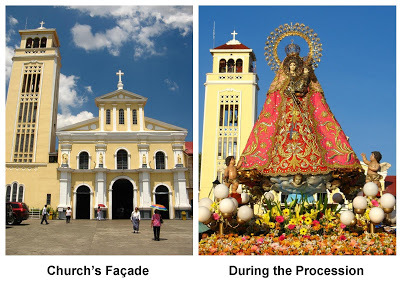 Manaoag Pilgrimage - held every 2nd week of April in Manaoag, Pangasinan. Devotees and pilgrims flock to the shrine of Nuestra Señora de Manaoag for the feast of the patroness of the sick, the needy and the helpless. Her image is believed to be miraculous. 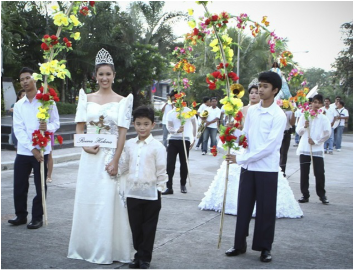 Flores de Mayo - held nationwide during the month of May. Literally meaning the "flowers of May", this fiesta commemorates the search for the Holy Cross by Reyna Elena and her son, the emperor Constantine. 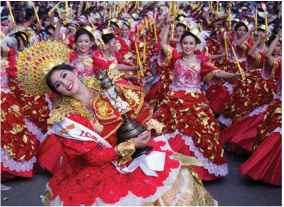 This Philippine wide fiesta is marked by a parade of maidens escorted by young men under floral arches. The main participant represents Reyna Elena and the emperor. Pahiyas - every 15th of May, farm families give thanks to San Isidro Labrador for a good harvest by decorating their houses with brightly colored rice wafers called kiping. Pulilan Carabao Festival - held every 14th of May in Pulilan, Bulacan. 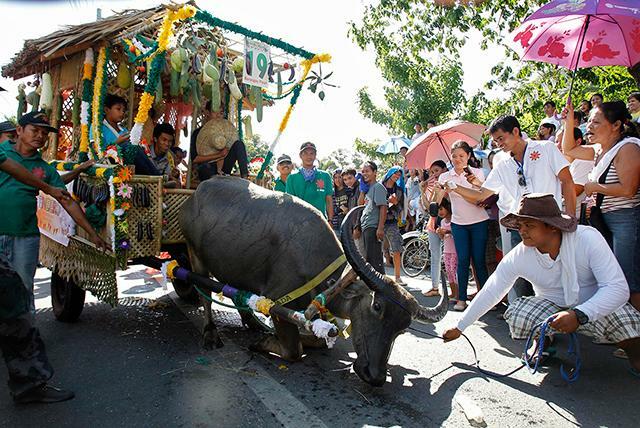 Hundreds of festively adorned carabaos are paraded by the farmers on the street leading to the church. There they are made to kneel down to pay homage to San Isidro de Labrador, the patron saint of farmers. 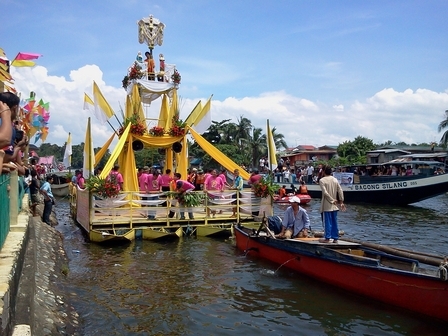 Obando Fertility Rites - held from May 17 to 19 in Obando, Bulacan. Massive numbers of men and women dance towards the town church praying for a wife, husband or a child. The pilgrims dance to San Pascual Baylon, Santa Clara de Assisi or the Virgen de Salambao for their wishes. 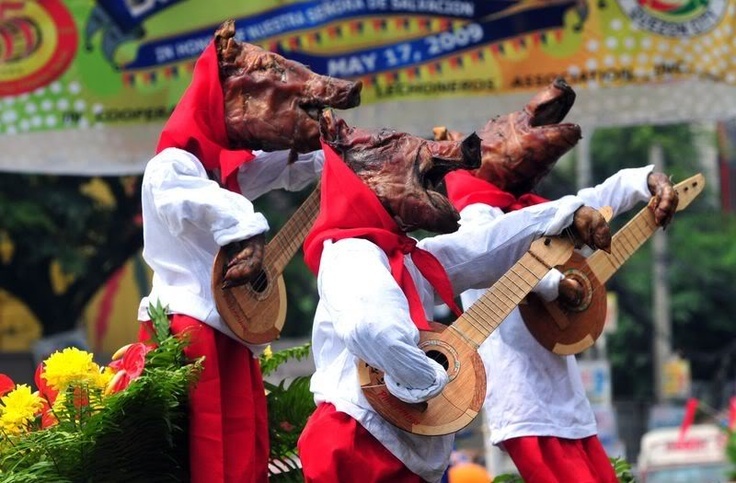 Parada ng Lechon - on the 24th of June in Balayan, Batangas, this festival literally translated as the "parade of roasted pigs". 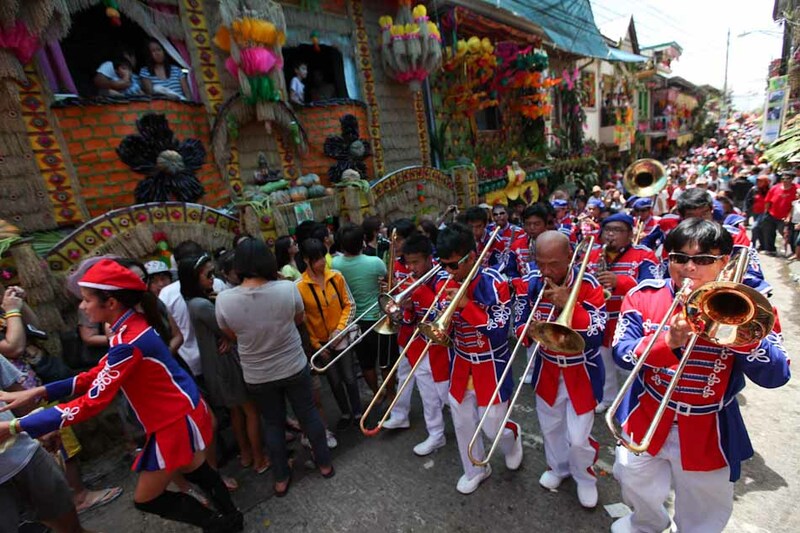 This fiesta is a celebration of the feast of St. John the Baptist. Roasted pigs are dressed up and paraded around town before being eaten. 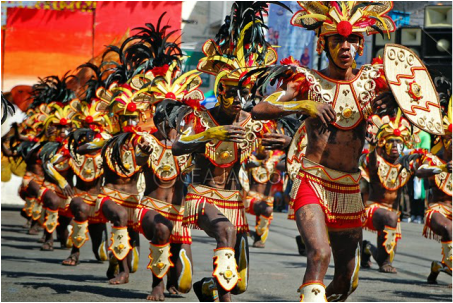 Pintados Festival - every 29th of June in Tacloban, Leyte, town folks parade through town with colorful body paint to recall their ancient warrior tradition where tattoos represented bravery and prestige. Bocaue River Festival - held every 1st Sunday of July in Bucaue, Bulacan. The highlight of this Philippine fiesta is the fluvial procession in honor of the miraculous Krus ng Wawa or Cross of Bocaue. Devotees douse each other with water as they scramble to ride the pagoda boat. 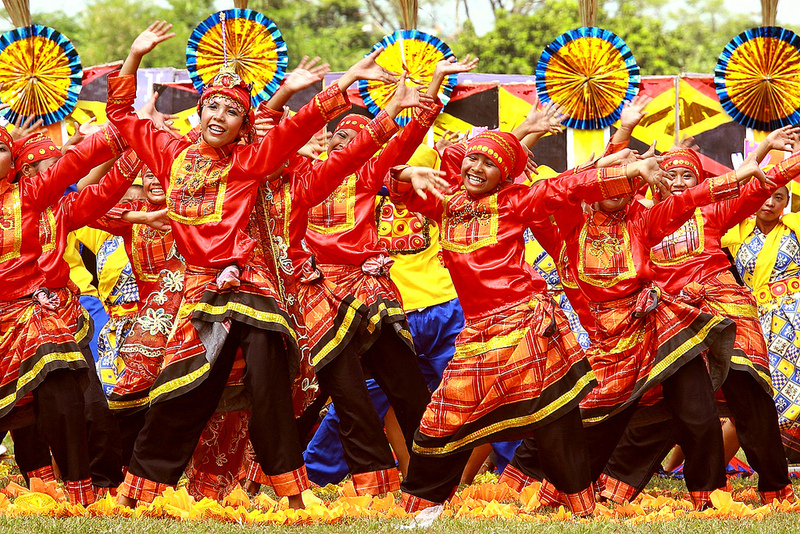 Raja Baguinda Festival - the 3 day festivities start on the 2nd week of August in Jolo, Sulu. The festivities commemorate the arrival of Raja Baguinda who is credited of spreading the Islam faith to the Sultanate of Sulu. 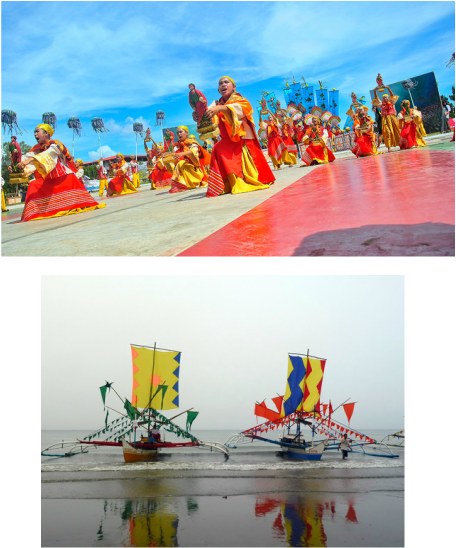 Sandugo Festival - which literally means "one blood", celebrates the blood compact between local chieftain Datu Sikatuna and Captain General Miguel Lopez de Legazpi. 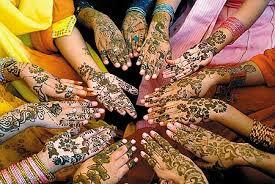 The festival is celebrated with street dancing, shows, trade fairs, beauty contest and other activities. 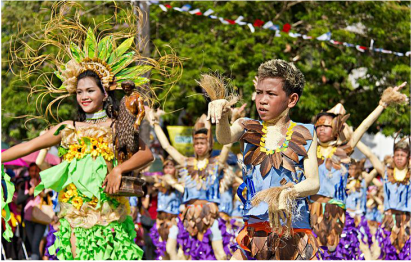 Sandugo Festival is a month long celebration culminating at Tagbilaran City, Bohol on the 3rd week of July. 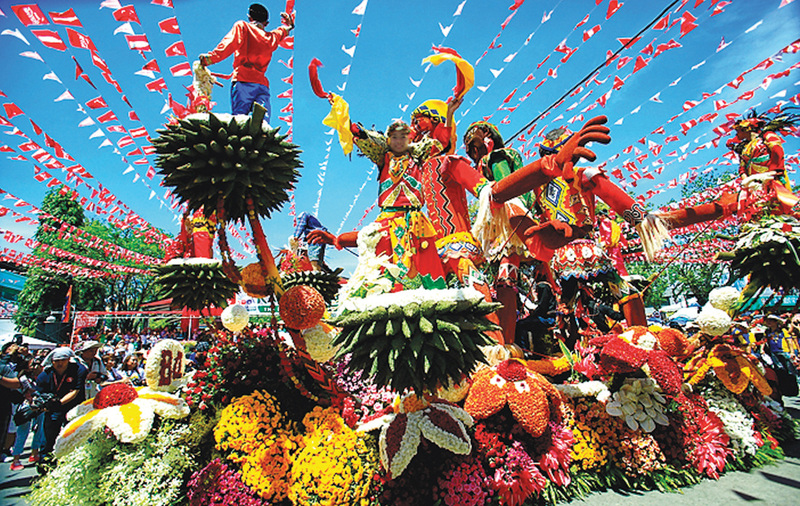 Kadayawan Sa Dabaw - held every 3rd week of August in Davao City.This festival give thanks to to the bounty of fruits and flowerers as the waling-waling orchid blooms. Colorful floats are bedecked with beautiful orchids and other flowers in the grand parade. 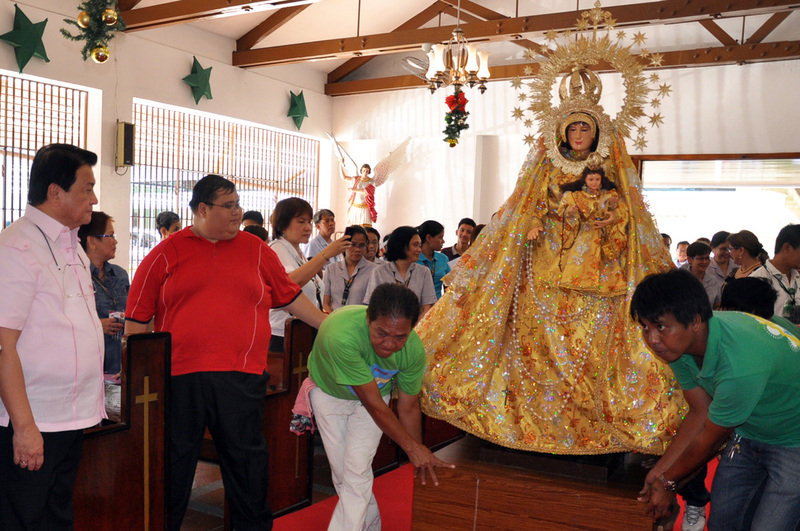 Feast of Nuestra Señora de Peñafrancia - celebrated every 3rd Saturday of September in Naga, Camarines Sur, Bicol Region. Highlight of this fiesta is the grand fluvial parade where the image of the Lady of Peñafrancia is carried through the river aglow with floating candles. 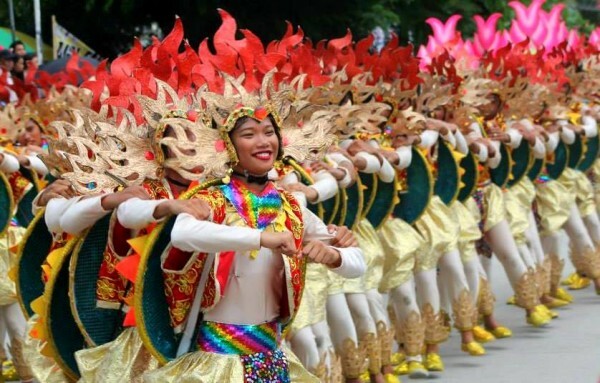 Masskara Festival - held every 3rd week of October in Bacolod City, Negros Occidental. Mask-making puts a quaint accent on the festivities to mark Bacolod City's charter day. Brass bands, beauty contests and parades are held before the evening's highlight of street dance where folks wear their beautiful masks. Higantes Festival - from November 22 to 23 in Angono, Rizal, male devotees carry the image of San Clemente in a procession that features pahadores, clad in colorful garb and wooden shoes and carrying boat paddles and higantes (giants) 10 feet tall papier mache puppets. San Fernando Giant Lantern Festival - celebrated the whole month of December in San Fernando, Pampanga. 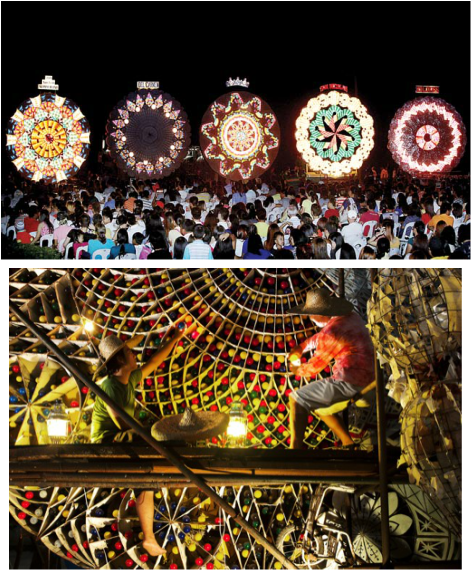 The festival culminates in a judging contest of the best, biggest and most beautiful Christmas lantern made by the local craftsmen in San Fernando. Binirayan Festival - fiesta dates are from the 28th to the 30th of December in San Jose Antique. Ethnic pageantry reaches a new high on the beaches of Maybato in San Jose and Malandong in Hamtik, where the drama of the first Malay settlement at Malandong is played out.